I love this intuitively birthed posterior baby and the lessons it tells about how amazing our bodies and our babies are when they work together. This is a once in a lifetime thing- a posterior baby born in the caul! This is the story of my 3rd baby. I have delivered all 3 of my children un-medicated. One at a hospital, one at home, and my 3rd baby was at a birth center because we were moving and my home was literally in boxes. My hubby had been working across the state for 3 months and we would see him most weekends. As my ‘due date’ came closer, I started to worry that he might miss the whole dang thing- my other 2 were early by 7-10 days. I was exhausted both physically and emotionally trying to work, pack, and care for these kids by myself. I casually asked my midwife if she would be willing to …….help, for lack of a better word………me go into labor when I was 38 weeks 2 days because I had been having contractions, was dilated to a 5 and effaced. (which is normal for me- I usually spend the last few weeks that way) I was truly terrified that my sweetheart wouldn’t make it if we didn’t get things going that weekend when he was in town. She agreed to try stripping my membranes, and giving me some herbs- but cautioned that it probably wouldn’t work because this was the earliest I had gone. She……helped………me at 10:00 on a Saturday Morning. I think I prayed more fervently than I had in a long time- 1) that baby would decide that today was in fact a great day to come, and 2) because I felt incredibly selfish that I had requested to be essentially “induced” via natural methods. (and this is not meant to offend those who do choose to be induced- it was just a tough decision for me to make.) She sent us on our way, and we went home to wait. After a couple of hours, contractions started to happen regularly- about every 3 minutes. They were not intense though- just regular. We walked around my neighborhood a few times to see if we could get them to intensify- but to no avail. They did keep coming though. We started doing pressure points- and immediately after my hubby- his name is Dan- would apply pressure to the inside of my ankle, an intense contraction would follow. So, every time I started to contract he would apply pressure. You have to push pretty hard- and I had bruises on my ankles from it! I had been in contact with my midwife throughout the day- and about 4:30 we decided * just in case * intense labor started to kick in that we would take our kids to my aunts house (she would be watching them overnight while I gave birth). I’m glad I heeded that prompting- because before we made the 7 minute journey to her house, I had 3 GINORMOUS contractions that took my breath away. This feeling was familiar, and I knew we would be heading straight to the birth center. I chose this sassy little get up to labor in- and labor truly picked up full steam ahead. My contractions brought me to my knees, and my low groaning with deep breathing helped me through them. In between, rocking side to side felt the best. I had only been there maybe an hour- and it was to the point where there was very little break from one contraction to the next. I needed the tub!! I LOVE the tub!! My midwife drew up my water- and I got in. * Que relaxing sigh* It felt so good- her tub is huge- I could move around and get into any position. It is also padded- which believe it or not made a huge difference. I found it very strange that I wanted to be up on one knee and in a deep squat with the other leg- because I distinctly remember with my 2nd baby thinking how uncomfortable that would be. My contractions were so strong- and I got to that point that we all get to and say “I can’t do it anymore- this is too intense”. I’m not afraid to say that with all 3 I have been brought to that point- and the triumph that comes after when you recognize the strength of your body and you do it. I felt “the urge”- that unmistakable and involuntary feeling of needing to push. But I also felt some reservation in doing so. With my other 2 I had pushed maybe 5 times and they were out. This time it was different- I felt like I needed to bring baby down slow. Instead of pushing with all of my might with each contraction- I breathed deep and held him back. It was the strangest feeling- my body took total control. At some point he had rotated to a face up position- which makes for a tough labor. I understood why I had the feeling of reservation and bringing him down slowly. Had I pushed and blasted him out, I very well could have torn from end to end. I am amazed at the body- amazed at what it knows if we just listen to it. At this point we still did not know the gender- we chose to be surprised. It wasn’t like I had imagined- I thought the first thing I would look for was if baby was a boy or girl. But, I just snuggled that sweet baby- amazed once again at this miracle we call birth. It wasn’t for a couple of minutes that we figured out he was indeed a boy- our THIRD!! And we were ecstatic. After a few minutes, I passed him off to Dan. I was so physically and emotionally exhausted that I could not hold him. 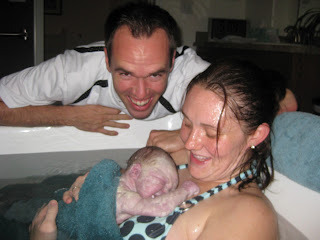 I sat in the tub for about 30 minutes waiting to deliver the placenta. Once that was all done, I stood up, showered off, and got snuggled in bed with my brand new baby boy. Every birth is a new testimony to me of the sacred and very real power we as mothers have to connect to our very souls- and have that connection be met by another living being. We work together- moms and babies. Every birth has been emotional for Dan- with each baby I have a similar picture of him crying with sheer gratitude and respect for this power we have been given. And that’s one of my stories. 7lbs 12 oz……..21 inches long. The entire time I was reading this I was thinking "this sounds so familiar!" then I got to the picture and recognized you guys and realized that I have heard it beore! Haha. Your birth story is beautiful! Congratulations and well done! I have given birth to many posterior babies, but none in their caul. What an amazing experience that must have been! I discovered this as I was googling information on this topic. I just gave birth to my baby boy (7th child) on July 5th and he was both "sunny side up an in the caul" too. Great combination! Congrats and well done to both of us now.